Mt Norikura snow resort will be opened on 10th Dec and closed on 9th April 2017. Mt Norikura is very close to Raicho. It takes about 2min by car and 10min by walk from Guesthouse Raicho. Free shuttle service is available everyday in the morning and afternoon. Now We’d like to introduce Mt Norikura in this post. Mt Norikura is located Chubu sangaku national park in Nagano Prefecture and altitude is more than 1500m above sea level. Therefore Mt Norikura is highly rated for best powder snow by skier and snowboarder. In addition, Here Norikura is usually sunny so the people can enjoy the landscape of beautiful Mt Norikura and the best powder snow. However temperature is extreme cold so please make sure the measures against cold!! Mt Norikura have 8 Lift and 20 Course so, beginner and advanced skier and snowboarder can enjoy the various course. There are snow park, mogul course, Kids park and school in the ski resort. There are 5 no compacted snow course. After snow, Powder junkies appear in early the morning and they make a new track on the no compacted snow course which is covered new powder snow. The meaning of side country is the short back country area at the course side of ski resort. 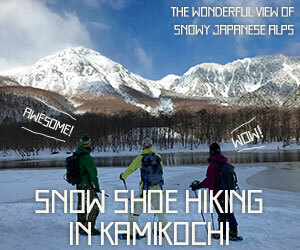 Mt Norikura allow to ski and snowboarding at the side of ‘Kamoshika’ course. These side country areas are also no compacted snow so, you can enjoy the powder snow and thrilling of going through the forest. ※If you ski or snowboarding at side country area, you need to take full responsibility for your actions. ‘Yumenotaira course’ is gentle slope and wide so, beginner and kids can practice the skill with an easy mind. When weather is fine, We can see the Mt Norikura(3026m) and Japanese alps at the Mt Norikura snow resort which are very beautiful and makes you relax and happy. Also, Mt Norikura is not many people especially week day and even though weekend you do not need to wait the ski lift because Mt Norikura is still not famous for foreign tourist at this moment. Lift ticket is sold with very reasonable price. You can get the discount ticket in most of the day. I’d like to introduce some discount ticket. Guesthouse Raicho is one of partner accommodation of Mt Norikura snow resort. If you stay Guesthouse Raicho, you can get the discount lift ticket. ※If you stay one night, you can buy the discount ticket only one day. ※Free shuttle service is available in the morning and after noon. Thursday：Discount for　More than 55 years old. Friday：Discount for the guest who do not lives in Nagano prefecture. Adult 1 people ＋ less than 15 years old 1 people　5200yen　※voucher is needed. College, junior college and technical college students can buy the one day lift ticket with 2000yen on week day of February and March　※voucher is needed. ※If you want to apply this service, you need to download dedicated smart phone application and bring voucher. For the detail please refer to the below web site. This discount is for the guest who lives in Matsumoto, Shiojiri, Azumino, Asahi, Yamagata, Suwa, Okaya, Chino, Takayama, Fujisawa and Himeji-city. This service is applied for the first time skier and snowboarder and more than 6 years old. Mt Norikura snow resort has english lesson. If you want to take a lesson, advance reservation is needed. For the detail please refer to the below web site or contact us. We will support your reservation. Last year, many guests who came from China, Hong Kong, Singapore, Malaysia, Australia took a english ski lesson. There are rental shop in the ski resort. Ski, snowboard, boots, suit, glove, goggles are rented with the below price. Finally, You can enjoy not only Mt Norikura snow resort but also back country ski and snowbording at Mt Norikura(3026m)and snow shoeing at Norikura kogen and Kamikochi in winter season with staying in here.